We have already heard the rumors about Black color, but now Samsung has officially announced four more color options for Samsung Galaxy S III. These four colors are Garnet Red, Amber Brown, Titanium Grey and Sapphire Black. Even though no word has been given about availability of all these colors, but it is very clear from Samsung’s press release that not all these colors will be made available in each and every market. Samsung says that the new colors seek inspiration from the richest materials of the Earth. Minhyouk Lee, the vice president as well as leading designer of Samsung Galaxy S III says that each and every inch of this smartphone is created in order to reflect the natural elements which also inspire the ergonomic design. Expansion of color range of Samsung Galaxy S III also means that the company is on the path of evolution of Minimal Organic design theme. Lee says that the color options evoke emotional as well as natural aspects of the smartphone in a very effective yet simple style. The company also says that the smartphone compliments the organic experience of the handset. 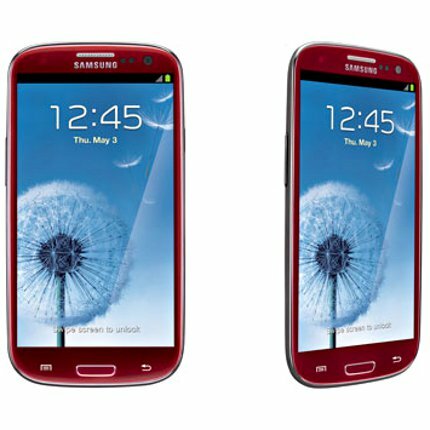 Released on May 3, Samsung Galaxy S III was originally available in two colors only and these were Ceramic White and Pebble Blue. Samsung Galaxy S III boasts 1.4 GHz quad core processor, 8 MP rear camera, 4.65 inch Super AMOLED HD display as well as front-facing camera. Samsung has already sold more than 10 million Samsung Galaxy S III smartphones, competing as the best and fastest selling smartphone in Samsung family as of now. What does each color say? The four colors announced by Samsung for Samsung Galaxy S III say something or the other. Amber Brown: According to the Samsung, Amber Brown is “inspired by the mysterious and unique gem, which was believed to sustain the secrets of the earth inside it.” The rich as well as deep color they say, redefine the classic nature of this color as well as emphasize on the beauty of advanced and organic design of Samsung Galaxy S III. Titanium Grey: Samsung says that the grey color is the color of intelligence, symbol of curiosity as well as insight. All these features are embodied in Galaxy S III design. This color is used because it expresses feeling of modernity as well as wisdom. It is yet not clear when these colors will be available in the markets and what all colors will be available in which market.